Later that day, Taylor competed in the 1600-meter medley relay. The 1908 Olympiad was the first time athletes competed in this race that required different runners in the relay to run different lengths. Taylor ran the third, or 400-meter, leg. 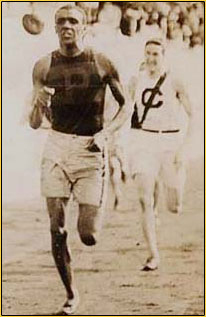 The American team won the race and Taylor became the first African American to win a gold medal at the Olympic Games. On December 2, 1908, John Taylor, twenty-six, died at home of typhoid pneumonia and was buried in Eden Cemetery in Philadelphia. He earned forty-five cups and seventy medals during his brief track career. Oceana Chalk, Black College Sport (New York: Dodd, Mead and Company, 1976).